Throughout the Collection Transition project there have been many small occurrences which have lent a certain poignant symmetry to our relocation of the artworks. 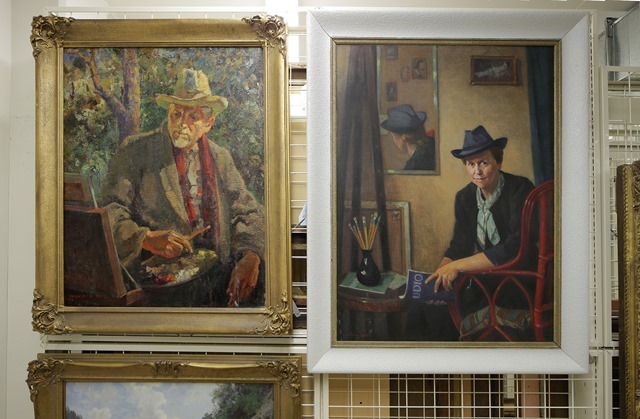 One such moment arose when two of our well-known portraits ended up side by side in the truck as they were moved to our new collection store at Sarjeant on the Quay. The portraits were painted by Antonio Dattillo-Rubbo (b.1870, d.1955) and Frances Ellis (b.1900, d.1971), and what makes this pair really special is that the artists painted the portraits of each other. Dattillo-Rubbo was born in Naples in 1870, immigrating to Sydney in 1897. It was in Australia that he began to teach painting and drawing at various schools to provide regular income for his family. In 1898 he opened his own art school and was much loved by his pupils who described him as ‘brilliant’, ‘inspiring’ and ‘a colossal teacher of drawing’. He encouraged experimentation and can be credited with helping to introduce Modernist painting to Australia along with his students. Frances Ellis was one of these pupils. Born in Taihape in 1900, Ellis studied at the Central School of Art and Crafts in London and travelled to Sydney before returning to New Zealand and teaching in Palmerston North around 1927. In 1934 she returned to Sydney, enrolling to become a student under Dattillo-Rubbo. It was during this time the two struck up a long lasting friendship. In 1939 when an elderly Dattillo-Rubbo could no longer manage the demands of his art school, Ellis became the head of the school. Both portraits depict their subjects doing what they loved most – painting. Dattillo-Rubbo spent many hours on his portrait of Ellis, which suggests he wanted to get it just right to do justice to his good friend. He gave the painting to Ellis and after her death it was gifted to the Sarjeant Gallery in 1977 by Ellis’ niece Yolanda Hutton. Ellis’ portrait of Datillo-Rubbo is one of her most well-known works. The painting was submitted to the Gallery of New South Wales for the Archibald Prize, an annual portraiture competition, where she was awarded runner-up. Datillo-Rubbo said that the work displayed “strong drawing, virile colour and excellent touch” and it was his wish that this work be gifted to the Sarjeant Gallery specifically. What is great about these works is that the Sarjeant is fortunate enough to have both of them. Viewing these works side by side you can see not only the influence of a great teacher but the evolution of painting in a time where a more traditional academic painting style of the older Datillo-Rubbo was being challenged by an experimental Modernist sensibility focusing on light and colour in Ellis’ portrait. When unpacking these works into the new collection store at Sarjeant on the Quay, we knew we had to hang these two side by side to let them carry on their conversation for many years to come.